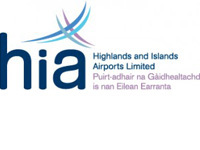 The latest airport passenger figures from Highlands and Islands Airports Ltd (HIAL) reveal a 7.4% increase in passenger numbers in the financial year 2017/2018. More travellers than ever before have used the company’s 11 airports across Scotland. A total of 1,780,521 customers used HIAL airports during the 12 month period from April 2017-March 2018, an increase of 112,098 passengers on the 2016/17 total of 1,658,423. Highlights include a 17.9% growth in numbers at Sumburgh Airport, a 9.3% year-on-year increase at Barra, 9.1% additional customers at Kirkwall, and 8.4% more passengers at Islay. Sumburgh welcomed 63,781 more passengers during the period with regularly scheduled flights supporting the oil and gas sector and an increase in offshore traffic, while Tiree’s numbers grew by 8%. Inverness passenger numbers increased by 46,855, further illustrating the airport’s popularity and increasingly important role as a driver for the Highland region and economy. The continuation of the airport’s Heathrow and Amsterdam Schiphol flights helped to boost numbers to 875,873 with all major routes from the city welcoming additional passengers. Operators Loganair and Swiss Air are both introducing new routes from Inverness in the coming months to destinations including Bergen and Zurich. Strong demand on flights from Glasgow to Barra, Islay and Kirkwall saw increases in passenger numbers at these airports, with Kirkwall attracting 195,982 passengers. Robust growth was observed at nine of the organisation’s 11 airports across Scotland. Mr Lyon said passenger numbers could have been even better, but the severe weather experienced in the UK as the Beast from the East arrived resulted in many of the country’s airports closing, which had a knock-on effect on flight traffic to airports including Inverness. Benbecula and Campbeltown airports logged 4.5% and 3.7% year-on-year growth respectively. Passenger numbers declined at Wick John O’Groats (-16.8%), due in part to a continued reduction in demand from energy sector services to-and-from Aberdeen, while Dundee (-43.4%) also recorded a reduction in numbers due to the loss of the Dundee to Amsterdam route. The company’s annual results for 2017/18 will be announced later in 2018.